So... Yeah. 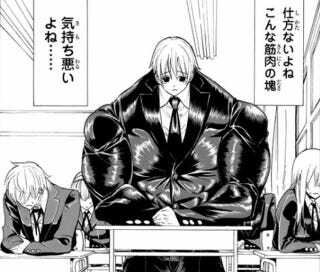 Mr. Macho/My Classmate is a manga that got a bit of traction on the interwebs in Japan recently because of, well, just look at it. Hearing the hubbub online, I had to see it for myself, and it turned out to be a hilariously entertaining read. Yuu Bakuryusai is a shy, withdrawn high school student with an abnormally well-developed physique. Thanks to his muscular form, he is constantly alienated from his classmates and targeted by delinquents who want to prove their strength by beating him in combat. Ever depressed, Yuu finds his life changing for the better for the first time when he meets Haruka Tsujizono, the only classmate who doesn't either run away from him or attack him. Unfortunately, his affections for Haruka put her in danger as Yuu's enemies see her as an exploitable weakness. Mr. Macho is your standard Japanese slapstick romantic comedy with a twist, and honestly, that twist is so outlandish, it works. The physical – heh heh – comedy involved is mindless and simplistic, but genuinely fun. For the most part, the characters are rather generically flat personality-wise. Yuu is your generic meek weak-willed pansy and Haruka is your basic tsundere heroine. The cast of side characters is equally unsurprising in terms of archetypes for anyone familiar with Japanese rom-com manga, but the humor more than makes up for the blandness of the characters. As for plot, Mr. Macho doesn't really go anywhere spectacular – at least, anywhere more spectacular than a high school teenager endowed with the ability to render people unconscious by flexing hard. So far there is only one six-chapter volume out, which is basically the introduction, so the lack of story progress can be excused. Besides, the manga is just damn funny. The humor is mostly what you'd expect: sophomoric jokes involving the juxtaposition between Yuu's timid personality and his massive figure. It's a bit of a one-trick pony, but the sheer extremes are such that I never found myself getting tired. Pretty much from the start, Mr. Macho takes its premise, turns the amp up to eleven, and cuts loose. I went in curious and left absolutely satisfied. I laughed. From start to end, I was either laughing, giggling, or grinning like an idiot. Mr. Macho is absurd, quirky, and a Hell of a lot of fun. While the one-note humor will probably begin to wear down as the series goes on, as it stands, it's an absolute blast. If you see the images and like myself, find yourself at a loss for words, take a gamble and give it a chance.